This dish gained a bad reputation during the Seventies and Eighties because it was often cooked so badly – drowned in an overpowering sea of rich, cheesy sauce. 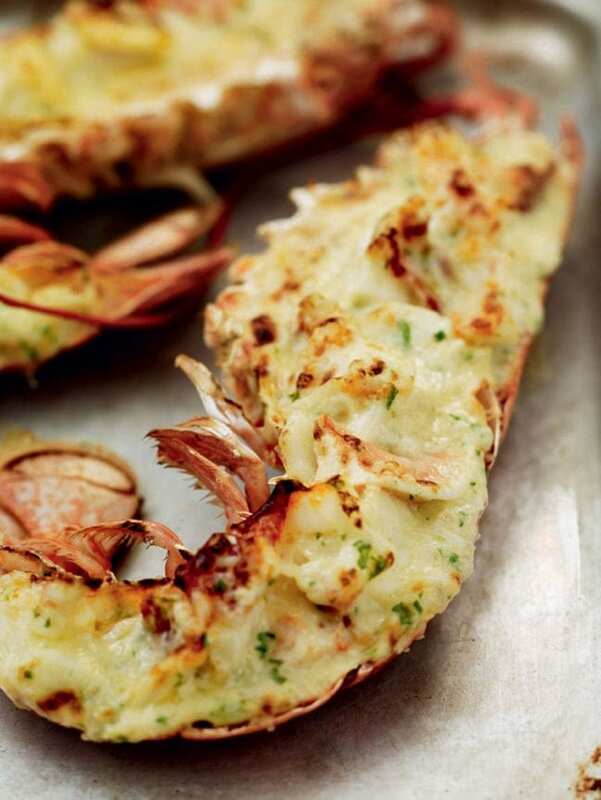 If it’s made with a just a little sauce that’s been carefully flavoured with small amounts of mustard, tarragon and Gruyère, it’s still one of the best hot lobster dishes there is. Put the milk, bay leaves, onion and peppercorns in a small pan. Bring to the boil, then set aside for 10 minutes for the flavours to infuse. Meanwhile, remove the meat from the cooked lobster and cut it into small, chunky pieces. Keep the tomalley (the grey-green liver) and any roe separate. Put the cleaned out half-shells in a small baking tray. Preheat the grill to high. For the sauce, reheat the milk gently. Melt 20g of the butter in another small pan, stir in the flour and cook for a few seconds. Strain in a little of the hot milk and whisk until smooth. Gradually whisk in the rest of the milk, bring to the boil, then lower the heat and simmer for 5 minutes, stirring now and then. You should be left with 200ml sauce with the consistency of thick cream. While the sauce is simmering, melt the remaining butter in another small pan, add the shallots and cook gently until soft but not browned. Add the wine, turn up the heat and simmer rapidly until the liquid has almost disappeared. Stir in the white sauce, together with the mustard, tarragon, chives, cream (if using), cayenne pepper and 25g of the grated cheese. Season to taste with salt and black pepper. Stir the lobster meat into the sauce, with the tomalley and any roe if you wish, then divide the mixture equally between the cleaned half-shells. Sprinkle with the remaining cheese, slide under the grill, then cook for 3-4 minutes until golden and bubbling. Serve with new potatoes and a light, green salad. Our friends at Majestic Wine recommend Chavy Puligny Montrachet Les Charmes. An indulgent lobster dish requires an equally luxurious white. Puligny Montrachet is the Chardonnay pinnacle and will match your lobster’s sweet flesh with decadent creamy peach intensity. Use promo code DELICIOUS to get £10 off your order when you spend £40 or more.